Best Beach Getaways offers a complex with more amenities than any other on Anna Maria Island, including the largest pool on the island! This cozy complex located directly across the street from the Gulf of Mexico is perfect for a small family getaway or a couples retreat. The complex boasts the amenities of a fitness room, pool clubhouse, tennis court, shuffleboard court, community BBQ grills, fishing pier, and kayak storage and launching spot. Bring your tennis rackets for a game in the sun while you listen to the surf, or you may rent rackets out of the maintenance office at your convenience. Enjoy a game of shuffleboard while you hear the waves crash. If you have a kayak or would like to rent one, store it at the onsite launching spot for a convenient and beautiful morning ride down the bay or sunset cruise to watch the fishermen return with their day’s catch. For the fishermen in your group, don’t forget your fishing gear to catch the morning fish runs, so you can catch dinner for yourself or the whole family! Feel free to use the community grills located throughout the complex for an island outdoor dining experience unlike any other. Runaway Bay is conveniently located next to the free Anna Maria Island trolley stop. Daily service runs from 6:00 A.M. to 10:30 P.M. every 20 minutes from the Anna Maria City Pier on the north to Coquina Beach on the south end of the island. If you would rather take a stroll on the beach, this complex is located within walking distance of restaurants, bars, and shopping to make the most of your vacation! 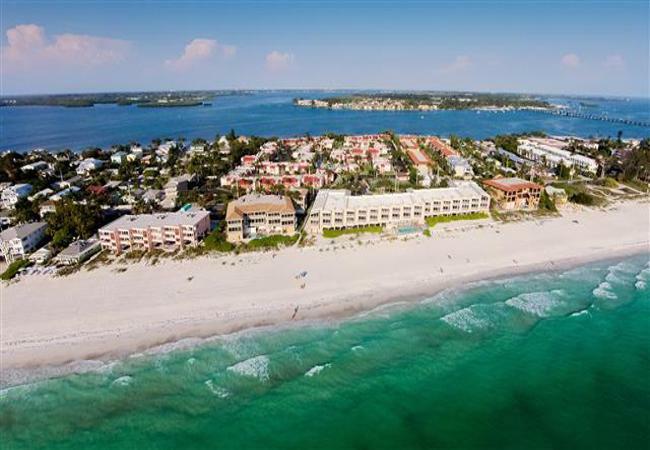 Featuring 1 and 2 bedroom fully furnished units, Runaway Bay offers all the comforts of home, plus ample amenities that make these some of the most sought-after vacation rentals in Anna Maria Island. Relax on the private balcony or lanai and take in the salt air and scenery that will keep you returning to Runaway Bay on Anna Maria Island for years to come.